Betsy Martin has wanted to be a doctor since volunteering at the Hospice and Palliative Care Center in her hometown of Shelby, N.C., when she was in high school. 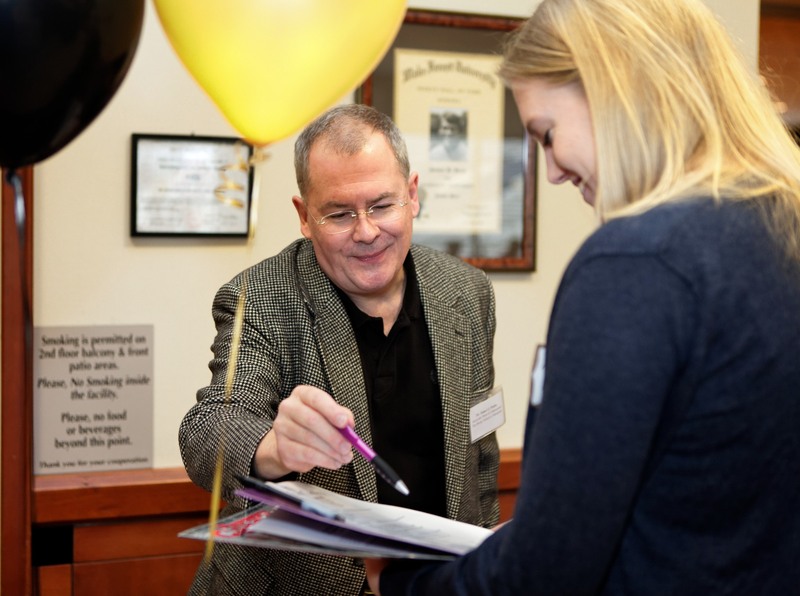 Now a junior at Wake Forest, Martin had the chance Thursday to explore a variety of medical careers during the University’s first Health Care Career Expo. Representatives from about 50 health-care programs — including chiropractic, nursing, optometry, physician assistant, pharmacy and physical therapy — were on hand to promote their programs. Recruiters from the U.S. Army and Navy promoted the scholarships they offer to students pursuing an education in health care. Representatives from the Wake Forest School of Medicine and the bioethics program and several international medical schools were also present. 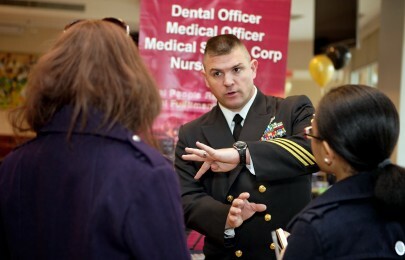 Navy Chief Hospital Corpsman James Seay talks with freshmen Morgan Dawkins and Shannon Speaker at the Health Care Career Expo. Freshmen Morgan Dawkins and Shannon Speaker stopped to talk with many of the representatives as they made their way around the expo, held at Bridger Field House. “It’s good to know what the schools are looking for,” said Speaker, who is from Ayden, N.C.
Pat Lord, a senior lecturer in biology, organized the expo, which she hopes to make an annual event. Lord is succeeding biology professor Hugo Lane as director of the Health Professions Program. “For students who are interested in medicine, I want them to realize all the available options that they have, such as osteopathic medicine, which isn’t as big in the South as it is in other parts of the country,” she said. Nearly one in five medical students in the United States is attending an osteopathic medical school, according to the American Association of Colleges of Osteopathic Medicine. Osteopathic doctors, known as D.O.s, take a holistic approach to treating the whole person. 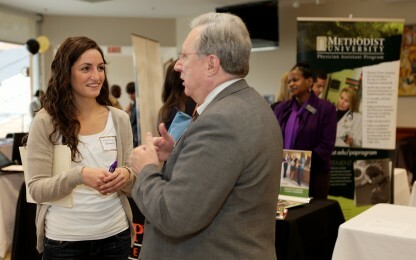 Senior Victoria Delbono talks with Thomas Reinders of the VCU School of Pharmacy. Seniors Casey Luckhurst and Tyler Dodds talk to Daria Winnicker of Sherman College of Chiropractic Medicine.